My wardrobe choices for work these days have been mirroring the weather - grey, grey, and more grey, with some black thrown in for contrast. For those of us whose mood is drastically affected by the season change, with long dark nights, and short grey days, this has been a rather "challenging" month. Some people might try to combat the onset of weather-induced bleak despair with bright colours, but not me! I'm going to make friends with the grey (we're talking clothing here, not hair...) and it so happens that many of my favourite items in my wardrobe are black and grey. 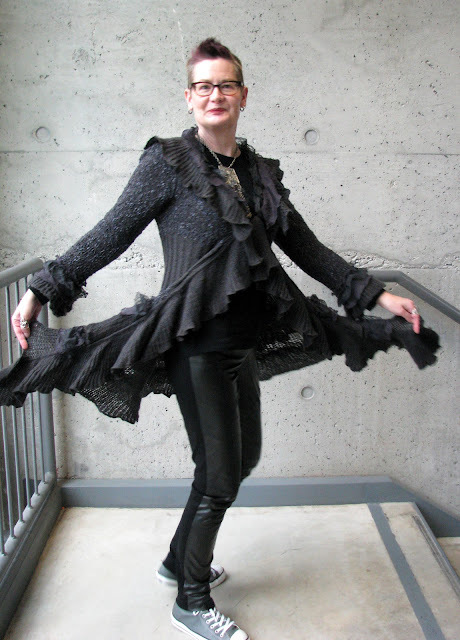 I'll throw in a twirl just to lighten the mood a bit, and to show off the awesome frilly-ness of my sweater. It's worth mentioning (to reduce the guilt) that although everything I'm wearing was purchased retail, all of it, including my shoes, was half price. Squinchy facial expression - I made it myself! I too really like grey, however as I recently decided to stop colouring my hair and it is now sprinkled with silver, I feel grey drains me. Perhaps adding another colour closer to my face might help. Otherwise I am going to have to rethink a lot of my winter wardrobe. Anyway for now it is summer, bright, sunny and very hot, so grey is not on the agenda. have a wonderful and safe festive season. Grey is pretty on you by the way! Glad this post isn't raunchy. ;) I quite like your pages much better! I'm with you on the black and grey. I bought a scarf last month which looks much like your sweater. And that sweater is gorgeous! Definitely Stevie Nicks worthy. I am not a grey loving person, I just can't pull it off (oh stop with the double entendres... It's your title that's got me all smutty!) but I do appreciate it on those who can, and you are looking fabulous, my dear! I love the flirty frills conversing with the no nonsense grey. Great mix of play and pragmatism. Best of all the grounding of the grey and lettuce hem cardi with the grey converse. I think you deserve an award for this outfit! P.S. I wore all / mostly non-full-price-but-retail today too - fascinating how we are noticing and feeling more things about it, including reflections on our own enjoyment. That sweater really is "awesomely frilly." I always feel right at home in grey. You are so write... we were channeling the same color this week! Love your shades of grey my dear! This is fab. I do love grey and am planning to reintroduce some into my wardrobe. It was my first favorite color; I was five at the time. Oooo, splendid sweater. I love all those frills, and the way you've paired it with those harder-edged pants and those runners is inspired - you took this from strictly feminine to something all your own - Love it! I like greys and blacks too. I love grey. That sweater is so much fun, I love it. Even though you are having a challenging month, you brightened my day with one of the most gorgeous sweaters that I've ever laid my eyes upon. I think I see some pleats amidst the frills. Perfect with the pants that fit like a glove and everything you chose to enhance your twirl. OOOO- I'm in love with that sweater--gorgeous!! You have outdone yourself. Love the leggings. I've been going through your blog. You make me want to me more brave!